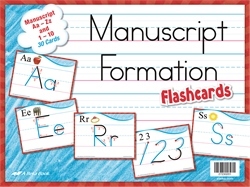 Give your child a visual reference for the correct formation of manuscript (printed) letters with these 9”x12” instructional flashcards. With the type-style letter and picture of the clue word given in the top left corner, your child will link the letter with both its sound and the typed letter as it appears in reading materials. These 30 cards are perfect for introducing each letter and number formation and are great for display. Display this colorful set as an alphabet around your schoolroom or use them individually as letter and number formations are introduced.